Fully German podium with Kittel and Ackermann ahead of race leader Viviani. Tomorrow's ITT stage starting order attached. 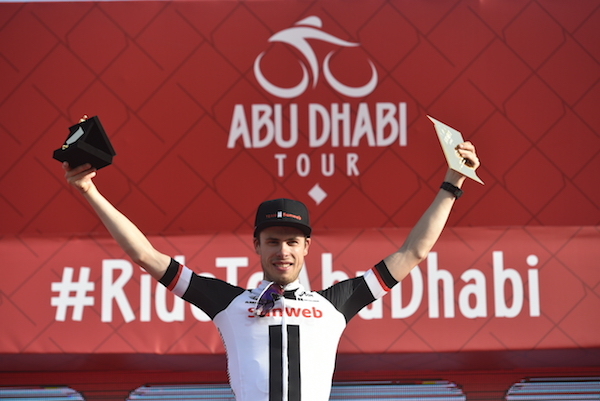 Abu Dhabi (Al Marina), 23 February 2018 – Phil Bauhaus claimed Team Sunweb’s first win of the 2018 season as a build up for further successes as he outsprinted two of his German compatriots, Marcel Kittel (Katusha-Alpecin) and Pascal Ackermann (Bora-Hansgrohe). 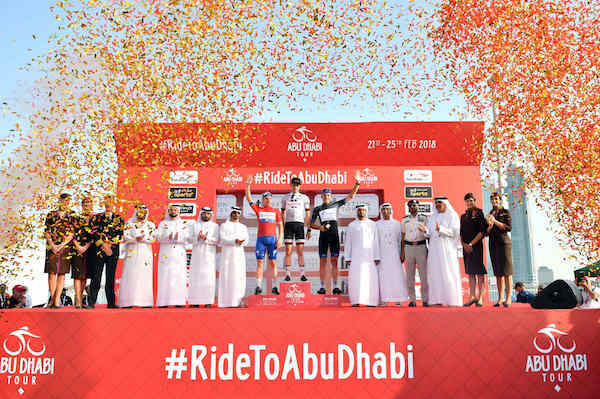 Fourth on the line, Elia Viviani (Quick-Step Floors) retained the red jersey ahead of the Individual Time Trial in which another Team Sunweb rider, ITT World Champion Tom Dumoulin, is expected to shine. Tomorrow, the first rider to start replica watches for sale will be Charles Planet (Team Novo Nordisk) at 13:15. 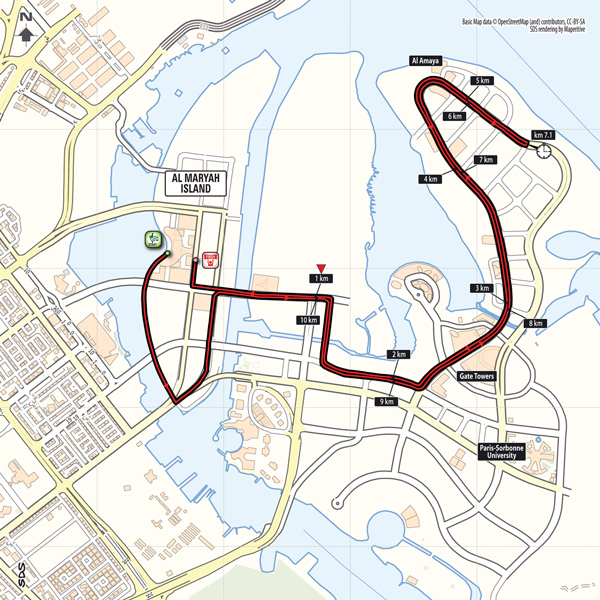 The last rider to start will be the Red Jersey, Elia Viviani (Quick-Step Floors), at 15:30. Starting order can be downloaded here. Al Maryah Island is Abu Dhabi’s new Central Business District, with dramatic turquoise sea views, the five-star Rosewood Abu Dhabi sitting at the core of the vibrant Sowwah Square and adjacent to it, the luxurious Galleria Mall. Cleveland Clinic Abu Dhabi opened in 2015 and is part of Mubadala’s network of world-class healthcare providers, bringing the highest international standards of patient care with 12 institutes including 5 centers of excellence in heart and vascular, neurology, digestive diseases, eye and respiratory and critical care. The 364-bed facility was developed in line with the Abu Dhabi government’s Economic Vision 2030 to develop a robust, world-class healthcare sector in the emirate. The five-star Rosewood Abu Dhabi arrived on Al Maryah Island in May 2013 and features 154 spacious guestrooms and 35 suites, along with 131 serviced residences. The tower was designed by renowned New York architecture firm Handel Architects and was inspired by the glistening Arabian Gulf and the vast desert that surrounds Abu Dhabi city. The five-star Four Seasons Hotel Abu Dhabi opened in 2016 and enjoys expansive views of both the city’s skyline and sparkling waves of the Arabian Gulf. The luxury hotel features 200 rooms and 38 suites, boasts striking architecture and unique design elements, and is a favorite with premium business travelers offering world-class standards of luxury and service. In the capital’s new Central Business District on Al Maryah Island, with spectacular waterfront and cityscape, The Galleria has over 130 of the world’s most renowned brand outlets - including 50 Abu Dhabi ‘firsts’. Abu Dhabi Global Market (ADGM) is a broad-based international financial center for local, regional and international institutions. ADGM was formed in line with the Abu Dhabi Economic Vision and is part of a comprehensive plan for long-term transformation of the capital’s economy by focusing on knowledge-based industries. Abu Dhabi Global Market Square (ADGM Square) is the commercial heart of Al Maryah Island. The area consists of four Grade A office towers, Al Sila, Al Sarab, Al Maqam and Al Khatem; as well as the Abu Dhabi Global Market Building. ADGM Square is seamlessly connected to two luxury hotels, Rosewood Abu Dhabi, Four Seasons Abu Dhabi; retail and dining destination The Galleria; and a 5.5km pedestrian promenade. A retail-led, mixed-use development on Al Maryah Island, Al Maryah Central is set to open in 2018 and will become the new flagship shopping, dining, and entertainment experience in the capital. It will feature the first Bloomingdale’s in Abu Dhabi, the first Macy’s outside of the USA, and more than 500 sought-after brands. Al Maryah Central will also be home to 100 restaurants, and offer a wide variety of entertainment options. This residential and commercial project off Abu Dhabi island’s coast, is home to one of the emirate’s architectural landmarks – the linked, Stonehenge-style Gate Towers. In the heart of the island, with an imposing central dome, Paris-Sorbonne University Abu Dhabi was the first French higher-education institution to open in the Gulf, and the university's first international campus.